I have just learned that President Trump has authorized the importation of elephant trophies into the USA. I am appalled and feel we must stop this outrage by taking a stand. When we have no more clean air, or water, or land, or wild animals, it will be too late. We must stop Trump now before he does anymore harm. Will you join me and send this message far and wide that elephants are not ours to kill and mount as trophies. Stand up to this greedy tyrant Trump, to remind him that the true measure of a man’s greatness is not in the trophies he’s garnered but in the innocent lives he has spared. Stand up to all tyrants. 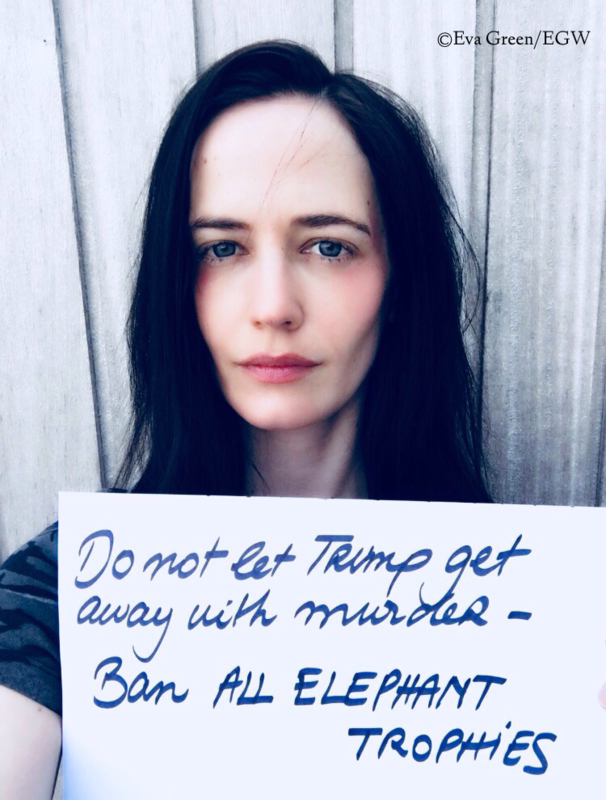 I wholeheartedly agree with Eva on this subject.It is simply wrong that elephants (or any animal)are hunted for trophies in any country.If Trump allows the imports of elephant parts it will increase the pressure on these wonderful animals. How any country can allow the hunting of animals for trophies is beyond my comprehension, and the argument that allowing some hunting raises money for conservation of the species is hard to understand. All hunting of these precious animals should stop! Thank you Eva for standing up for these wonderful animals. Your understanding of the earth’s connectivity is spot on. We share such a beautiful planet and we all should do our bit to protect it. We must stop him! Elephants are beautiful creatures; we cannot afford to lose them! Great action by this brilliant being! I wish all other s people would do the same. Very happy of this bold initiative ! And all the caring of our benevolent elephants. Beautiful message from a beautiful girl. As an American, it pains me to say that I have never been more ashamed to be a citizen under this vile, disgusting creature’s so called leadership. Hopefully this will all be over soon and we can go back to being a nation that’s a caring neighbor with liberty and justice for all. Trump is not gonna win, love is gonna win. Yeah! I agree , than elephant legs , palm trees are better, as they look like elephant skinned to satisfy, wealthy enthusiasts. I guess , a must see is the Global Footprints and Impact very much and in India where I live is Bangalore!. And my neighbor city Mysore , elephants are used for Processions! I invite you see it once, if you say! I can be ur guide. Trophy elephants should not be allowed on any occasion. It’s a sign of disrespect to nature and humanity. I’m not taking picks, and I hope they won’t see this as a case against Trump, but I agree that his policies have been catastrophic and absolutely reckless in regards to the environment! And I’m a Republican! Who voted for Trump! And lol to Victor’s message above, I know that in India they’re becoming extinct. The whole world, Europe, India, was reacting against it. It’s a relief she raised her voice about this crucial issue. Just was watching Animal Planet and saw how Large animals like Elephants and Hippos work hard to survive during droughts and then changed the channel to Another channel showing beautiful wineries , such a contrasted life for animals and Human beings. They have already many problems to deal with and I guess we should leave the animal alone at least set apart killing them ! Uff! Hope our opinions change peoples mind set. Let the no of animal lovers increase. God bless all. Yes this is so very true !! Eva, you’re an angel. This message is so important, thank you for that. my total support! But this doesn’t give me anything but doubts. On the one hand, you are taking an honorable stand with the elephants but, on the other hand, you endorse rapists and/or pedophiles by working with/for them (two, as you well may know). Am a chilean musician and, with my band (all girl rock trio, Lilits), were invited to a retail store festival, were we would be payed all the money that we needed to finish our album but we DID NOT go for it, as it represents the exact opposite of what we are ruling for! for they fire pregnant women, pay low wages with ridiculous working hours…and blah…..it was an unthinked “NO”. There are just things I don’t get. Don’t be so neutrally warm…..BURN!! Very inspirational your campaign!! Total support. To the girl fan above, I think you mixed. She’s an actress, and work with them because they’re brilliant artists (you can’t deny that !). Perhaps it’s time to open a bit your mind? I believe you’re this great actress, and standing for a campaign it’s not inconsequent, but the contrary. I wish the best to everybody, and that everybody see the light. Best Wishes !! What a great campaign!! I admire you and think you’re a great actress, and this message is really important. To the girl fan above, I think you’re mixed. They’re great artists (you can’t deny that!) and she’s an actress, maybe you have to open your mind a bit? Eva Green I’ll send a letter ! I wish everybody well and for everyone to find the light. Best Wishes!! Greets from Stuttgart. I wrote comment here, but on page doesn’t show. What a great campaign!! I admire you and think you’re a great actress, and this message is really important. To the girl fan above, I think you’re mixed. They’re great artists (you can’t deny that!) and she’s an actress, maybe you have to open your mind a bit? Eva Green I’ll send a letter! I wish everybody well and for everyone to find the light. Best Wishes! !